We’re back for another unfortunate trek through the lives of the tragic Baudelaire orphans. Today we’ll be delving into the finale – episodes 7 and 8, which make up the story known as The Miserable Mill. Spoiler warning for the show and somewhat for the books as well. Trigger warning for child abuse, violence, body horror, murder/death, as well as emotional abuse, hypnosis, and unrequited love. Mr. Poe realizes the children are missing and panics, only to immediately be distracted by nearby food. Meanwhile, the children are riding on the back of the truck, on their way to Lucky Smells Lumbermill. The truck driver eventually notices the stowaways and kicks them off, forcing them to walk the rest of the way. They travel to the town where the lumber mill is located – a mostly burned down town called Paltryville. A sign on the lumber mill entrance says all trespassers will be put to work. The Baudelaires enter anyway. They meet Charles, who co-owns the place, and he introduces them to his partner Sir. The children learn that Paltryville used to be a more cheerful place but was burned down. The arsonists are rumored to have been their parents. Sir lets the children stay at the mill as long as they agree to work there. The sleeping quarters they are given are in poor condition, and they are loathed by their fellow workers due to the rumors about their parents. However, they do befriend one of the mill workers – an absurdly optimistic man named Phil. Klaus wants to leave the lumber mill, but Violet is intent on staying for the purpose of clearing their parents’ names. The following morning, the children are woken up by the foreman banging pots together, and they begin a day of labor too difficult and dangerous for children to be doing. They are given a five minute lunch break where only gum is served and discover all workers are paid only in coupons. When they ask the mill workers why they don’t leave the mill and get a better job, the mill workers simultaneously stand up and chant, as if in a trance, that the mill is their life and their home. The Baudelaires attempt to visit the library during their break but are prevented by Sir. They try to convince Charles to stand up to Sir and help them, but he merely gives excuses for his partner. Because the foreman’s face is always hidden, Klaus wonders if he might be Count Olaf in disguise. So while the foreman is asleep, Klaus tries to sneak a peek at his ankle to see if the tattoo is there. He instead discovers the foreman is the hook-handed man. What’s more, the hook-handed man wakes up and catches him, breaks his glasses, and announces he must be sent to the optometrist. Klaus is walked to the eye-shaped building by Phil. He meets Georgina Orwell. The eye appointment turns ugly when Dr. Orwell straps Klaus to the chair, tells him she used to know the Baudelaire parents but has since changed her name and face, and then begins to hypnotize him. Meanwhile, Violet and Sunny sneak into the library. All the books in the library turn out to be just several copies of the same book – a history of the lumber mill written by Sir himself. She opens one up and looks up a chapter on the Paltryville fire, only to find it blotted out. Searching through book after book, this chapter is blotted out in every copy except one. But before she has a chance to read it, she is forced to hide as Sir comes by. He finds the book and rips out the page. While hiding, Sunny finds a hidden dictionary with their father Bertrand Baudelaire’s handwriting inside. Next, Violet eavesdrops on a conversation between Sir and Charles, in which Sir mentions making a deal with someone and in return keeping something a secret. She sees him toss the ripped out page into the fireplace. She leaves before she gets to see Charles rescue the papers. Klaus comes back to the mill late and in a trance. He still doesn’t have glasses, won’t answer questions, and answers “Yes, sir” to everything. The next morning, the foreman orders Klaus (who is still in the stupor) to make mulch with the wood chipper, while he holds Sunny dangerously close to the chipper. Violet rescues Sunny and tells Klaus she misses him an inordinate amount. He snaps out of the trance. The mysterious couple, who may or may not be the Baudelaire parents, are hiding from people searching for them in the woods. They sneak out, only to be attacked by a refrigerator repairman on the road, who they fight off. They call Sir to ask if the Baudelaires are at the mill. Sir lies and says it would be ridiculous to put children to work in a mill. The husband hangs up the phone and tells his wife that today will be the day they reunite with their children. The next we see of them, they arrive at a fancy yellow door. The Baudelaire children are told they have visitors and are escorted to a fancy yellow door. Next, we see the mysterious couple open the door in front of them… but the similarity in doors is merely a coincidence. The couple are at their home, where they greet their children Duncan, Isadora, and Quigley Quagmire. The woman embraces two of the children while the third child hangs back nervously and asks his father about his leg. Returning to the Baudelaires, their visitors turn out to be Dr. Orwell and “Shirley” – Count Olaf in disguise as a female receptionist. “Shirley” calls Klaus a lucky boy, and he goes into a trance once more. 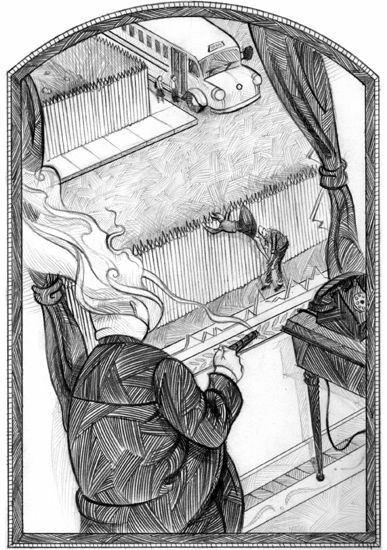 Mr. Poe calls Sir and asks if the Baudelaires are there. Just as he did to Mr. and Mrs. Quagmire, Sir lies to Mr. Poe and says the children aren’t there. Mr. Poe crosses the mill of his list of locations the children might be. Lemony Snicket foreshadows a tragic accident that will soon happen at the mill and shows broken glasses on the floor that look like Klaus’s. Mr. Poe’s boss, Mr. Tamerlane, says he has orders not to fire Poe for the Baudelaire’s disappearance, but he can demote him. Mr. Poe is hysterical at the demotion, and his wife vows to get to the bottom of the kids’ whereabouts. Klaus, who is once more in a trance, is ordered by the foreman to work the stamping machine. This leads to an accident where the machine stamps Phil’s leg. Though he is optimist as always and believes himself to be fine, his co-workers team up to take him to a hospital. Sir is upset about the property damage and says if the kids cause too much trouble, he’ll send them away. Sir says the accident will cost him an inordinate amount of money. Klaus comes out of the trance. Violet encourages Charles to stand up to Sir. Charles is appreciative and tells her there’s something he wants to tell her about their parents. First, though, he says, he has an appointment to go to. Unfortunately, the appointment is with Georgina Orwell, who plans to hypnotize Charles into working against the Baudelaires, so he’ll stop being a nuisance and looking into the deal she and Sir made. In a flashback, we see that Sir and Dr. Orwell made a deal where she’ll hypnotize his mill workers so he can enjoy their free labor. We also see that “Shirley” has convinced Sir that she wants children and that if the Baudelaires cause too many accidents, Sir should hand them over to her. When Violet realizes the danger they’re in, she changes her mind about staying at the mill. But this time, Klaus convinces her to stay so they can investigate. They sneak into Dr. Orwell’s office and see her hypnotizing Charles. Olaf hears them making noise upstairs. And when the children hide from him in a closet, they find skeletons there as well as records of all the mill workers being hypnotized. Later, when they are safely back at the mill, Charles is encouraging Sir to get rid of the Baudelaires. The children, meanwhile, are trying to figure out the word that will bring the mill workers out of their trances. During a narrative sequence, Lemony Snicket shows a 200-page book Beatrice wrote, explaining why she couldn’t marry him. In the middle of the night, the foreman fetches Klaus and, putting him back into a trance, orders him to send a log that has Charles tied to it into a saw. Violet follows. And while she figures out that “fire” is the word to unhypnotize Charles and the mill workers, it doesn’t work on her brother. She shouts “fire” over the intercom, unhypnotizing all the mill workers (except Phil, who is still at the hospital), and they begin to riot against Sir for the labor they’ve been forced into. Sunny starts biting at the ropes that are holding Charles to the log while Violet tries to stop her brother from pushing it into the saw. She discovers “lucky” is the word to make him obey commands, and she and Olaf battle to get control over Klaus. This is put to a stop, however, when Dr. Orwell comes and orders Klaus not to listen to his sister. Orwell stops Sunny from rescuing Charles. Violet realizes that every time Klaus has snapped out of his trance, it was always after someone had said “inordinate.” She says the word, and Klaus comes out of his trance and stops the saw right as it is cutting into Charles’s foot. Since the villains still want an accident to take place, Dr. Orwell plans on throwing Sunny into the furnace. But when the rioting workers break in, the surprise causes her to accidentally back into the furnace herself. The glasses on the ground that Lemony showed us last episode turn out to be hers, not Klaus’s. The workers attack Sir, who flees the mill. Olaf and his henchmen also escape. And after many fights with Dr. Orwell, Olaf vows never to take a partner again. The media attention surrounding the accident gets the attention of Mrs. Poe, and Mr. Poe arrives to fetch the children. Charles thanks the Baudelaires for saving his life and announces he’s going to search for his partner. He gives the children the ripped pages he saved, which states their parents didn’t start the Paltryville fire but rather that they helped the survivors back on their feet. Phil returns from the hospital, still just as optimistic as ever (and also probably still hypnotized as he wasn’t present when Violet shouted "fire"). Returning to the Quagmire mansion, the couple decide to tell their children the truth about their lives and vow to do so the next day. They never get the chance to do so, however, as there is a mysterious woman parked outside, who sets their house on fire similar to the way the Baudelaire mansion was burned down. Mr. Poe is promoted to Vice Principle of Orphan Affairs. He informs the Baudelaires that no guardian is willing to take them in, so they must instead be sent to boarding school. They arrive at Prufrock Prepatory School, which is designed like a graveyard with buildings that resemble tombstones. Mr. Poe gives Klaus a package that is addressed to them from Jacquelyn, and inside is the broken spyglass. They are sent to meet with the principle of the school. They don’t know it yet, but sitting behind them are two of the three Quagmire triplets, who have apparently been orphaned by the fire to their home as well. We see a silhouette of the school’s vice principle playing violin in his office and are then shown an old school photo where we see Count Olaf and Lemony Snicket as students. The season ends with a final musical number. I think the season finale is possibly my favorite story in the Netflix adaptation for far. The Miserable Mill is the only story this season that hasn’t been previously adapted to screen, and I thought it was very well done. Seeing Neil Patrick Harris as a woman was quite fun (and, as many fans of the show have pointed out, strangely attractive). I really like the energy and creativity the actor brings to the role. And I'm really glad the show was open about Sir and Charles being partners; their relationship was vague in the book and a subject of controversy in the fandom. It was also quite interesting to get more backstory on Georgina Orwell. In the books, we don’t learn anything about her. She was never revealed as Olaf’s ex but rather seems to appear out of nowhere and helps in his plan. Since she was the first character to act as an equal to Olaf rather than a henchperson beneath him, she was quite a mysterious figure in the story. And I wonder if the now-revealed backstory of her being an ex-lover to Olaf is canon to the author’s intention in the books. I was curious about how they would do the sword/tooth fight between Orwell and Sunny, but they apparently decided to leave it out entirely. Some fans, I'm sure, are glad of that, since it's the moment in the entire series most requiring suspension-of-disbelief. It would have been amusing to see, I think. But I suppose it would have been too difficult and expensive to create a scene like that with a CGI baby, especially on their limited budget. Although it was probably the least faithful to the books, what changes were made were made for good reason. Originally, the children were sent to the mill by Mr. Poe, and Sir was their guardian instead of their employer. It made sense for them to travel there on their own instead and to investigate the mysteries about their parents, so the secret organization plot could be introduced to the series earlier. It also made sense for the mill workers to be victims of hypnosis (which they were not in the books--at least, as far as we know). In the books, most of the mill workers were Sir’s relatives. The only change that upset me was the choice to show Sir’s face. In the books, Sir remains a mysterious figure throughout the series, notorious for having an unpronounceable name and a face that can never be seen through the cloud of smoke that follows him. Many theories have surrounded his character – including speculation he could be Lemony Snicket himself (who also hides his face), in disguise as a villain. None of this mystery is present in the show, however. Instead, he’s just a self-centered businessman. It was nice seeing yet another Daniel Handler cameo. I was also quite pleasantly surprised to see a cameo from a certain female villain whose name I will not spoil. And I love that we got to see Prufrock Prep and a sneak peek at its vice principle, since everyone originally thought we wouldn’t get to see either until next season. The same can be said about the Quagmires. The reveal about the mysterious couple’s true identity was quite bittersweet, since it was sad they weren’t the Baudelaire parents after all. But seeing the Quagmires a season early is quite exciting. I noticed one of the Quagmire triplets acts quite oddly. He hangs back while his other two siblings rush to hug their parents and (assuming it’s the same boy and not his brother) gives a cynical response when his parents talk about their school days. I wonder which of the triplets this is and why the showrunners chose for him to behave this way. This episode left me with a few questions. In the books, we never hear about Mr. Poe’s boss. And since there are so many secrets hidden in this series, I have to wonder who Mr. Tamerlane is, who he works for, and why he wasn’t allowed to fire Mr. Poe. There’s also a rather odd scene where Georgina Orwell gets into the building despite the mob outside, and when Olaf asks her how she did it, she says, “I don’t trust you with all my secrets.” What does this mean? Also, why did the mysterious couple – who we now know are the Quagmire parents – call Sir to ask about the Baudelaires? Overall, I thought season one was brilliant, and I can’t wait for season two. Join us next week where we’ll tell you what secrets we know about the show’s second season! In the meantime, sound off in the comments. What did you think about Netflix’s A Series Of Unfortunate Events?